UNIDENTIFIED FLYING OBJECTS or FLYING SAUCERS? If you have been awake any at all the past few years, then I am quite sure that you have heard at least something about the UFO'S. Now if by chance you have not heard anything at all about UFO'S, then just do a quick search on the Internet and read a few pages or watch a few videos on YouTube or view a few Television programs on Ancient Aliens or UFO disclosure. So then, what does the Bible have to say about the UFO'S? Well, let us get into the word of Almighty God and find out. This study in God's word actually begins with the UNDERSTANDING that Satan has been given a set TIME as to when he will be judged. We must also UNDERSTAND that there is a WAR going on between God and his enemy that Red Dragon called the Devil and Satan in Revelation chapter 12. Perhaps the best place to begin is with Matthew 8:28,29 where Jesus comes across two men that are possessed by devils and these evil spirits cry out to Jesus and basically telling Jesus, now wait a minute Jesus you have NO RIGHT to torment us yet, because it is not the TIME! "And when he (Jesus) came to the other side into the country of the Gergesenes, there met him two POSSESSED with DEVILS, coming out of the tombs, exceeding fierce, so that no man might pass by that way. 29. And, behold, they cried out, saying, What have we to do with you, Jesus, you Son of God? Are you come here to torment us BEFORE the TIME?" These devils or evil spirits that POSSESSED these two men asked Jesus if he came here to TORMENT them BEFORE their TIME was up. In other words, there seems to be a TIME that is coming that Almighty God will deal with Satan and these evil spirits and they KNOW that this particular TIME that Jesus came along and cast them out of the man that this TIME in history was BEFORE their TIME ran out. This tells me that Satan and the fallen angels KNOW exactly WHEN their TIME is UP and they will be cast out of the heavens down to the Earth and judged. Let us read this same account of Jesus casting out these devils from one of the other gospels before we move on to some other passages of scripture in the Bible that speak of a TIME when Satan will be dealt with by God and the devil KNOWS that his TIME is RUNNING OUT quickly! Please read Mark 5:1-13, which we see Jesus casting out these same devils, who ADJURE or COMMAND Jesus NOT to TORMENT them. 7. And cried with a loud voice, and said, What have I to do with you, Jesus, you Son of the most high God? I ADJURE you BY God, that you torment me NOT (or I COMMAND you BY the AUTHORITY of Almighty God that you leave us alone and torment us NOT). 8. For he (or because Jesus had) said unto him, Come out of the man, you UNCLEAN SPIRIT. 9. And he asked him (referring to Jesus asking the evil spirit), What is your name? And he answered (or the demon answered), saying, My name is Legion: for we are many. 10. And he (the evil spirit speaking for all the devils that possessed this man) sought him much that he would not send them away out of the country. 12. And all the devils sought him, saying, Send us into the swine, that we may enter into them. 13. And forthwith Jesus gave them leave. And the unclean spirits went out, and entered into the swine: and the herd ran violently down a steep place into the sea, (they were about two thousand;) and were choked in the sea." Now in this particular passage of scripture, there is no mention of a TIME, but we do see the phrase "we ADJURE you BY God that you torment us NOT" which definitely lets us know that the devils KNEW that Jesus did NOT have the RIGHT to TORMENT them. And when we compare scripture with scripture we see that the REASON that Jesus did NOT have the RIGHT to TORMENT them as yet was because their TIME was NOT UP. In other words, the devils KNEW that they had TIME remaining BEFORE it was TIME for them to be TORMENTED. Even though Jesus, as the SON of God, did NOT have the RIGHT to TORMENT these devils BEFORE their TIME, Jesus still was GIVEN AUTHORITY over them as a MAN to cast them out of any man in order to set man free from their torments and oppression. You see my dear brothers and sisters in the Lord, THIS, the devils being cast out of the man that they possessed was NOT what the word of God is referring to as their being TORMENTED at the END of the AGE when their TIME would be UP. For a deeper understanding of this subject of WHY Satan is ALLOWED to torment mankind please read the study entitled "UNDERSTANDING WHY? ", but for now let us continue to see HOW Satan and the devils KNEW what TIME it was when Jesus came upon them, and HOW they KNEW that their TIME to be TORMENTED was NOT yet COME? So then, HOW did Satan and these devils KNOW what TIME it was? Did they have a way to KEEP TRACK of TIME? I personally believe that Satan is, in fact, keeping track of his TIME and I believe he KNOWS the exact day that his TIME is UP. But HOW? Does Satan have a CALENDAR that he can look at that is keeping track of his TIME? Now for me personally, I am leaning toward believing that Satan does, in fact, have a CALENDAR and that some of Satan's calendars could be among the many ancient structures found on the earth such as mega stones tracking the moon and solar equinoxes. This study is not just about the the possibility of some of these ancient massive stone structures being calendars to keep track of the time that Satan and the fallen angels have left before Almighty God says enough and sends his Son to pour out his wrath, but rather the purpose of this study is about all the INEXPLICABLE massive stone structures that are presently being QUESTIONED as to their ORIGIN as being ALIEN in nature. This study is about EXPOSING these so called ALIENS as being the fallen angels and Satan and showing that Satan and the devils have been given a specific TIME as to when they shall be judged. To me, it is made clear in the Bible that the end of the TIME that God gave to Satan to show that he created Lucifer his anointed cherub PERFECT from the very day he was created is drawing near. In others words, Almighty God has ALLOWED Satan a CERTAIN amount of time to prove to Satan, to the fallen angels, and also to the angels who remained faithful to God that he did NOT create Lucifer with his rebellious nature, as God is being falsely accused of doing. Please bear with me for awhile longer and I will tie everything together for you using the word of TRUTH, the Holy Bible, the very word of Almighty God. Please turn to the book of Revelation and read Revelation chapter 12, verses 7 through 17, which describes a WAR that is going to take place in heaven where Satan and the principalities and powers and rulers of darkness are presenting ruling over this world system. And AT this TIME when Satan and his fallen angels are cast out of heaven they will KNOW that they only have 1260 days LEFT before they are BOUND for a 1000 years to await their TIME of ETERNAL TORMENT in the lake of fire that was prepared for the devil and his angels. Here is Revelation 12:7-17, which describes this WAR in heaven between the ANGELS of Almighty God and Satan and the fallen ANGELS. 12. Therefore rejoice, you heavens, and you that dwell in them. Woe to those who inhabit the earth and of the sea! For the devil is COME DOWN unto you, having great wrath, (WHY? Why is Satan so full of wrath?) because he KNOWS that he has but a SHORT TIME. 13. And when the DRAGON saw that he was cast unto the earth, he persecuted the woman which brought forth the man-child. 14. And to the woman were given two wings of a great eagle, that she might fly into the wilderness, into her place, where she is nourished for a TIME, and TIMES, and HALF a TIME (or she was nourished for 3 1/2 years, or 42 months of thirty days each, or for 1260 days), from the face of the SERPENT. 15. And the SERPENT cast out of his mouth water as a flood (or a great army) after the woman, that he might cause her to be carried away of the flood. 16. And the earth helped the woman, and the earth opened her mouth, and swallowed up the flood (or the great army) which the DRAGON cast out of his mouth. 17. And the DRAGON was wroth with the woman, and went to make WAR with the remnant of her seed, which keep the commandments of God, and have the testimony of Jesus Christ." I want you to notice how many times in just this short passage of scripture that the word of God makes mention of the DRAGON and the SERPENT in relation to the DEVIL being SATAN that OLD SERPENT the DRAGON. With this in mind I want you to take a CLOSE look at the Mayan ruins and see all the imagery of the SERPENT and the DRAGON that is connected with these ANCIENT ruins, which I believe were BUILT by Lucifer before he was lifted up in his pride and REVOLTED against Almighty God to ascend up ABOVE the CLOUDS and EXALT his THRONE above the throne of Almighty God. 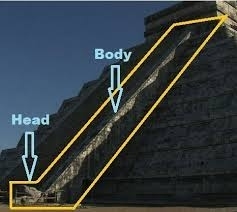 If you look at a picture of the Mayan pyramid known as the Pyramid of Kukulcan at Chichen Itza, or Chichen Itza in the Yucatan peninsula of Mexico that was taken on the spring equinox, you will see where the sun casts a shadow or light on the north stairway that REVEALS the body of a SERPENT that is DESCENDING down to the Earth. This light or shadow also appears on the stone head of a serpent that is at the bottom of these stairs. This shadow or light only appears during the equinox and can be seen for only a few minutes. Here is a link to a video on YouTube that shows this shadow appear on this spring equinox if you would like to take a quick look before continuing on in this study of God's word showing the connection between these ancient structures and the Bible. 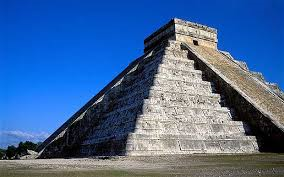 Here is a link to a video on YouTube that shows this shadow appear on this spring equinox if you would like to take a quick look before continuing on in this study of God's word showing the connection between these ancient structures and the Bible. Also, this video on YouTube, which is about 6 minutes long, shows the shadow or light reflection gradually appearing and then after a couple of minutes it gradually disappears again not to be seen again until the next equinox. Now in order for this phenomenon to occur the builders of this step pyramid needed to possess a vast knowledge of astrology and mathematics. They needed to know the movement of the sun, moon, and stars so that the pyramid could be built at the precise angle and positioned with the exact north, south, east, and west alignment or orientation, in order that this shadow be cast on the stairs on the exact day of the equinox of the sun having equal day and equal night. In other words, this pyramid was NOT built by a primitive culture such as the Mayan or Aztec Indians. Now there are some in the world that will have you to believe that these primitive Indians were highly developed and then for no known reason all this vast knowledge of astrology and mathematics just vanished until the twentieth century. Others in the world would have you believe that these primitive Indians had the help of extraterrestrials or aliens that gave them the knowledge or even assisted them in building these ancient wonders. However, I propose to you that these ancient wonders that the world cannot explain were NOT built by mankind at all, but rather were built by Lucifer BEFORE mankind was ever created. Even in some of the Mayan mythical writings there is mentioned being DIFFERENT AGES. And in these and other ancient writings there is also mentioned the DESTRUCTION of these different AGES of creation. For a deeper understanding of the Luciferian age or the antediluvian age and it's destruction please read the study entitled "UNDERSTANDING WHY?". Also, you might want to check out this website that has many creation stories from every tribe and nation and age. My main point is this study is that at a CERTAIN point in time, the WAR in the heavens will come to a climax, and Satan KNOWS that he has very little TIME LEFT before he is to be bound for a 1000 years in the underworld. So Satan will look for a man that is in power and he will possess this man and give this man power to make war with God's people the Christians and the Jews the only two witnesses that stand for one true and only Almighty God in the Earth. This war of the Antichrist against God's people will last for 3 1/2 years or 1260 days to be exact and then there will appear in the heaven the sign of the coming of the Son of man, Jesus our Lord and savior to gather together his church to himself and bring this WAR in heaven to and end for a 1000 years. Israel will recognize their Messiah at this time and will call on his name to be saved alive. The Mayan pyramid appears to be a calendar marking the spring equinox. So it appears that the spring of the year is important to the builder of this step pyramid. I myself am not setting any dates or prophesying a date for the coming of Jesus, but rather all I am doing is trying to explain the seemingly inexplicable structures on the earth that are raising QUESTIONS as to whether God exists. The Bible seems to indicate that Jesus will come again in the FALL of the year, which is SIX months after the SPRING of the year. So 3 and 1/2 years from ANY SPRING of the year will end up being in the FALL of the year. One of these structures is the step pyramid in Central American that I gave a link above for you to research on you own, but for now I want to point out that there are 91 steps on each of the four side of this structure that add up to 364 days and the final step is the top platform making a total of 365 steps which represent the 365 days of the solar year. 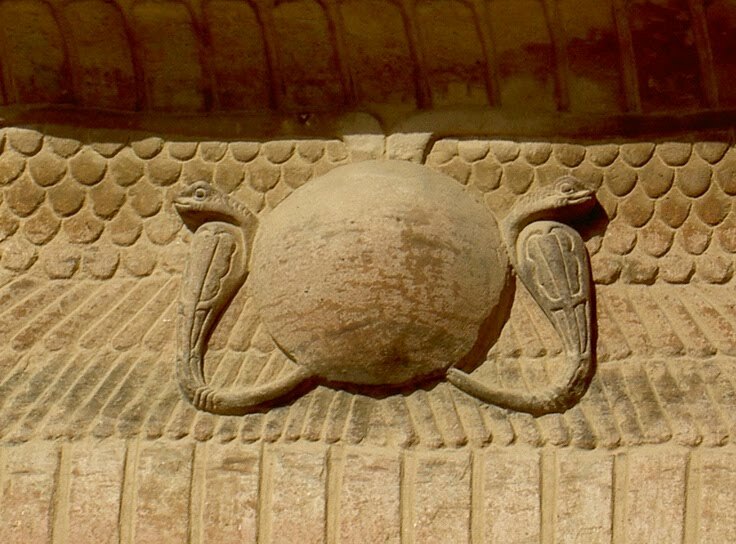 And the site is filled with images of SERPENTS where some could be seen as DRAGONS. Again I am not setting any dates, but rather showing some connection between the ancient structures and the Bible. The Bible speaks of a great deception where even the very elect could be deceived. However, before I introduce the great deception and what I personally believe that it may quite possibly be I want to backtrack a little and share with you, my readers, the passage of scripture that show us that Satan is the god of this present world and that Satan along with his fallen angels are the ruling principalities and powers that are ruling in the air, the sky, or the atmosphere of the Earth. First I would like you to please read 2 Corinthians 4:3,4 where we learn that Satan is the god of this present world. 4. In whom the god of this world has BLINDED the minds of them which believe NOT, lest the light of the glorious gospel of Christ, who is the image of God, should shine unto them." Then we go on to continue to read in Ephesians 6:10-12 that we are to be strong in the Lord and in the power of his might and fight against these principalities and powers in the heavens above the Earth that are ruling this world system. Remember Jesus said we are IN the world, but we are no longer of this world. 12. For we wrestle NOT against flesh and blood (or fellow man), but against PRINCIPALITIES, against POWERS, against the RULERS of the darkness of this world, against spiritual wickedness in HIGH places." 14. Now I am come to make thee understand what shall befall thy people in the latter days: for yet the vision is for many days." The question then arises, will we, as human beings, witness this WAR in heaven between Almighty God where Michael and his angels that fight against Satan and his angels. I believe the answer to this question is quite possibly a YES. And if I am correct, then I believe that the witnessing of this heavenly war will be the STRONG DELUSION or great deception spoken of in 2 Thessalonians chapter 2 that will DECEIVE those who are not aware of what is taking place. What I mean by this is that the WORLD is setting the stage for DECEPTION by calling this WAR in the heavens an ALIEN WAR between UFO'S from other worlds and then putting forth THEIR OWN INTERPRETATION that there is NO GOD and that these so-called ANCIENT ALIENS where just MISUNDERSTOOD as being gods. Please take a moment and read 2 Thessalonians 2:7-12, which teaches us about a deception or strong delusion that will deceive the world, but that will not us who BELIEVE the word of TRUTH, at least those of us who KNOW what is taking place. I do believe that some Christian will also be deceived in these last days by the things that will take place. However, it is my prayer that you my readers will get a hold of the TRUTH of the WHOLE word of God, which I teach and NOT be DECEIVED by our enemy that is HINDERING believers in this present world and will continue to HINDER, until he be taken OUT of the WAY and CAST DOWN out of the MIDST of heaven to the Earth. Here is 2 Thessalonians 2:7-12, which teaches us of this TRUTH. "For the MYSTERY of iniquity does already work (or Satan and his principalities and powers who are WORKING behind the scene unknown to the world or SECRETLY tempting and influencing mankind to sin and rebel against God): only he (speaking of Satan) who now lets (or Satan who now HINDERS the people of God in his present position as the god of this world) will let (or will continue to hinder God's people), until he (speaking of Satan) be taken out of the way (or UNTIL Satan and his fallen angels the principalities and powers and rulers of darkness of the air are cast out of the MIDST of heaven into the Earth during the coming WAR spoken of in Revelation chapter 12. This phrase "taken out of the WAY" literally means to be taken out of the middle or removed from in between, or cast out of the midst of). 12. That they all might be damned who believed NOT the TRUTH, but had pleasure in unrighteousness." "Yea, and all that will live godly in Christ Jesus shall suffer persecution. 13. But evil men and seducers shall wax (or grow) worse and worse, deceiving, and being deceived." And then we read in Daniel 11:32-35 that people of the LIGHT, or Christians who KNOW shall do mighty works and lead MANY to Christ. "And such as do wickedly against the covenant shall he corrupt by flatteries: BUT the people that do KNOW their God shall be strong, and do exploits. 34. Now when they shall fall, they shall be helped with a little help: but many shall cleave to them with flatteries (Speech that tries to convince you that there is no God or some other lie of the enemy, like Jesus is not coming, or God would not want your family to suffer so go ahead and take the "mark" so you can but food for them. Today Muslims are converting people to ISLAM by DECEIVING them with FLATTERIES that we all worship the SAME God and even some Christians are being deceived into becoming Muslims. I myself am convinced that ISLAM IS the MARK of the BEAST. Please read the study "COULD ISLAM BE THE MARK OF THE BEAST?"). 35. And some of them of understanding shall fall, to try them, and to purge, and to make them white, even to the time of the end: because it is yet for a TIME APPOINTED." Just as we have a TIME APPOINTED so does Satan and the fallen angels have a TIME APPOINTED for them as well. And Satan who is called the god of this present world is setting the stage even now to TRY and DECEIVE the whole world that Allah is the SAME God of the Holy Bible. And for those who are not deceived by this lie of the enemy, called Satan the devil, is trying to deceive them that the is NO God at all. 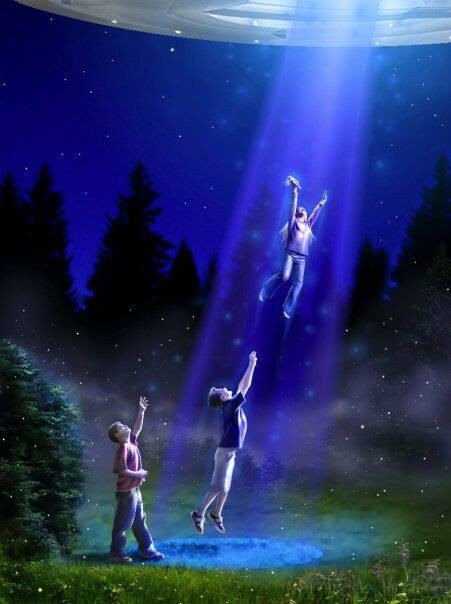 COULD UFOS BE INTERDIMENTION SPIRITUAL BEINGS? From this passage of scripture we can see that Satan's THRONE was at one time UPON the EARTH and because of PRIDE he EXALTED himself and REBELLED against his creator Almighty God and declared his intention to overthrown Almighty God and exalt his earthly throne above the STARS or above the ANGELS of God, then God passed judgment upon his and the angels that followed him in his coup or rebellion against God to overthrow Almighty God, his Son Jesus, and his angels. Now please keep in mind that this was not just Satan committing a transgression against God, but rather Satan was trying to take over God's throne completely. 10. And it (the little horn or the ANTICHRIST) waxed (or grew) great, even to the host of HEAVEN; and it cast down some of the HOST and of the STARS to the GROUND, and stamped upon them. "And it shall come to pass in THAT DAY, that the LORD shall punish the host of the HIGH ONES that are on HIGH, and the kings of the earth upon the earth. These SIGNS in the SUN, and the MOON and the STARS are one of the KEYS to WHEN Jesus is coming again and when Satan is to be bound for 1000 years while Jesus reigns on the Earth. For a deeper understanding on this subject please read the studies "THE SECOND COMING of JESUS" and "THE GREAT TRIBULATION". But for now, let us continue this study in God's word to learn HOW this WAR in heaven in the future will DECEIVE many on the Earth. Then how many in this world would be DECEIVED into believing that the is NO God, if there suddenly appeared in the sky a WAR between UFO's and some of these UFO's were shot down to the Earth. And then the aliens in these extraterrestrial spacecraft claimed they were the God, or rather that they were mistaken to be God by those that witnessed seeing them in the past, seeing that the world is ALREADY headed in this direction? If you think that I am being too dramatic, then I strongly urge you to start WATCHING. Begin taking a look at the History Channel at PROGRAMS like Ancient Aliens or UFO Hunter that are PROGRAMMING the world to believe that there is NO God. Search the Internet for material on this subject matter. But for now, let us get back to this study in God's word on the ANGELS using CHARIOTS as the WINGS or manner of HOW they fly. Please keep in mind that people back then who had NO UNDERSTANDING of flying machines or modern technology had to use what they KNEW as a way to describe what they saw. Therefore they drew WINGS like a bird to illustrate FLIGHT. Thus the winged DISC or a flying SAUCER shaped craft was drawn with WINGS to show that this disc-shaped object flew. Thus WINGS represented FLIGHT. Then we read in Psalm 104:1-3 where the Lord our God makes the CLOUDS his CHARIOT to walk or fly upon the WIND. 17 The CHARIOTS of God are twenty thousand, even thousands of ANGELS: the Lord is among them, as in Sinai, in the holy place." It appears that God has many many thousands of CHARIOTS for him and his ANGELS to RIDE in when Jesus comes again to execute the WRATH of Almighty God. One of the things that some Christians do not realize is that Almighty God himself is coming WITH his Son Jesus when Jesus comes again to receive his bride the church to himself. Pleases read Habakkuk 3:3-8 where we see Almighty God the Father AND his Son Jesus the Holy One coming in CHARIOTS of salvation. We read in Isaiah 31:4,5 a description of the SECOND coming. And in this prophecy, God is described as FLYING like the BIRDS. "For thus hath the LORD spoken unto me, Like as the lion and the young lion roaring on his prey, when a multitude of shepherds is called forth against him, he will not be afraid of their voice, nor abase himself for the noise of them: so shall the LORD of hosts come down to fight for mount Zion, and for the hill thereof. 4. And his brightness was as the light; he had horns coming out of his hand: and THERE (speaking of the HORNS in his hands, THERE) was the hiding of his POWER. Please read Revelation 9:1-11, where we are told of a STAR or more specifically this STAR is, in fact, an ANGEL that falls or rather is CAST DOWN from heaven or the sky. Notice that this angel that is cast out of heaven is given the KEY to the bottomless pit to loose those who have been bound there. This is why I believe that this ANGEL that is cast out of heaven is Satan. But first Satan must deceive the world that the Christians and the Jews, the only TWO witness that stand for God, must be killed for whatever reason. Perhaps the lie Satan spreads about these only TWO witnesses that stand for God is that we are aliens from another world that were planted here long ago and that we will side with they enemy that is fighting against him and his fellow aliens who he says have come in PEACE to help the people of Earth fight against this other threat from deep space. I don't know what LIE Satan and the antichrist will use to DECEIVE the world into persecuting and killing the church and the Jews, but with all the UFO sightings in the past 60 plus years I cannot help but believe that somehow this is all going to come into play to DECEIVE the world into believing a LIE that would NOT believe the TRUTH. 11. He made darkness his secret place (or God remained in outer space out of sight and some of his army of angels hid in the CLOUDS of the skies for their covering); his PAVILION (God's tabernacle or dwelling place or what God RODE in and did FLY) round about him were dark waters and thick CLOUDS of the skies. 15. Then the channels of waters were seen, and the foundations of the world were discovered at your rebuke, O LORD, at the blast of the breath of your nostrils. 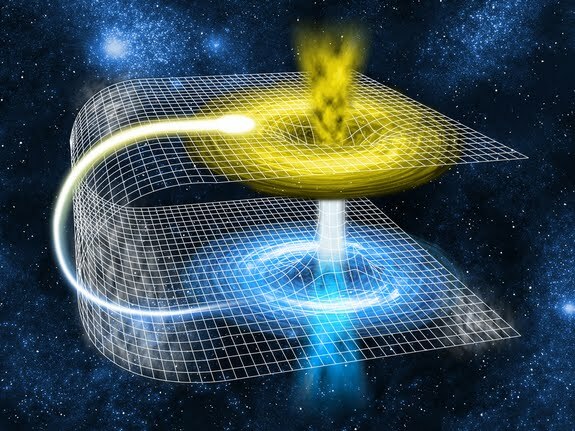 If one were to view an illustration of a wormhole as describe by some scientists today and were to picture flying craft entering one side of this wormhole and coming out the other side on the Earth it would no doubt appear as a LADDER, so to speak, in which these flying spacecraft were using to get from one place to another. Here is an illustration of a wormhole where space is BENT or BOWED together to create a passageway or a "ladder" if you will. Could this be what Jacob saw in his dream with angels flying through the gate of heaven coming down to the earth? Now I know that this is speaking of the eastern GATE of the city of Jerusalem, but when we consider how God HIDES his plan in account such as this, then it is not a stretch for this verse and other verses to have DOUBLE meanings. Compare this verse with the second coming of Jesus. What does the Bible say about the EASTERN SKY and how the COMING of the Son of man shall be even as lighten that COMES OUT of the EASTERN sky and shines unto the western sky? "WHO are these that FLY as a CLOUD, and as the doves to their windows (or hover as doves landing in windows)?" 31. And he shall send his ANGELS with a great sound of a trumpet, and they shall GATHER TOGETHER his elect (those the WAIT upon the Lord who will MOUNT UP as wings of eagle or be caught up in the CLOUDS to meet Jesus in the AIR and FLY as the BIRDS like Isaiah 31:4,5 describes) from the four winds, from one end of heaven to the other." In other words, we are the EAGLES that are GATHERED TOGETHER in the AIR over this battlefield where there are already many dead bodies and we will help Jesus execute the WRATH of Almighty God from the AIR being IN the CHARIOTS or spacecraft of the Almighty on those who refuse to repent and call upon the Lord to be saved or spared alive. Then I think Psalm 27:5 ties things together for us to give us a more realistic picture of what is actually going to take place. The angels of the Lord shall beam us up, so to speak, aboard these CHARIOTS of God and we shall be taken in these winged discs flown by the army of angels to MEET Jesus in the AIR over this place called Armageddon to help execute the wrath of God upon those Islamic Muslims armies that will be fighting against Israel. In other words, we shall be HID or protected from God's wrath as well as the armies that are fighting against God's people Israel, because we will be in God's PAVILION, or in his tabernacle. Or more specifically we will aboard his fly spacecraft and RIDE with Jesus and his angels in CHARIOTS or what is known today as UFOS. "Then Isaiah the son of Amoz sent to Hezekiah, saying, Thus says the LORD God of Israel, That which you have prayed to me against Sennacherib (which means SIN has increased the brothers) king of Assyria (this king of Assyria is a type pr shadow of the antichrist or Satan behind the antichrist in the last days) I have heard. In this passage of scripture, we see that Satan and his angels also have these CHARIOTS to fight in the heavens. There is coming a WAR in heaven and if this war is visible to mankind, then these STARS that the Bible speaks of that FALL from heaven or the sky could very well be ANGELS that are RIDING in CHARIOTS know by us today as UFO's being shot down to the Earth.